Which is the time at Linderhof that husband Jim goes into the kitchen and into his shaker which he has filled with ice, pours a quantity of gin, a soupcon of vermouth and shakes. Somehow he always manages to pour just enough for two perfect martinis. In the breakfast room, with music on the stereo, we visit about our day and sip our martinis before dinner (which may be quietly bubbling on the stove or in the oven). After busy days, it's a great way to get together and reconnect, to tell each other what we've been doing. It's a great way to end a day and begin an evening. It's Friday which means that it's time for Foodie Friday with Michael at Designs by Gollum. Stop by and see what everyone has been cooking up this Friday. Obviously, at Linderhof, we've not been cooking . . . . but we've been pouring! That looks good! I've never made a martini but it sounds easy and I DO enjoy drinking them. Thanks for the instructions, I will have to give it a try! Bon appetit'! Not only have I never MADE a martini, I've never TASTED a martini. My daughter is all about CHOCOLATE MARTINIS so I must at least TRY one! My hubby and I share those same moments - every day. Whether it's with or without a cocktail or glass of wine it's a wonderful time of day. We talk about our day, the news, whatever is on our minds. 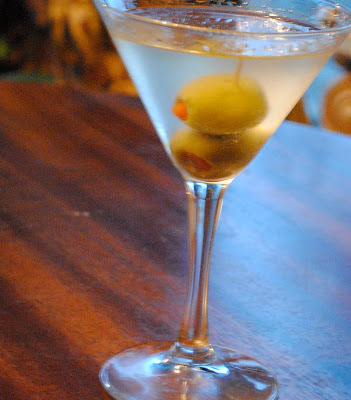 What a civilized tradition - and I love a good gin martini....always with an olive! This sounds wonderful. Been a while since I've had a martini, but it is one of my favorites. Why did the cocktail hour go out of fashion? I think it is very necessary! Cheers, Martha! I love this. I don't want to seem creepy but every evening I think: Jim and Martha are enjoying a chat over martinis, how lovely! I love this tradition, reminds me of Darrin and Samantha. I love the ceremony you make over just about all the delicious moments in life! Poring is excellent therapy when in the company of family and good friends. I loved your photos today. Way to early for a drink, but I think I'll have another cup of coffee. Cheers! we do the same over a sip of wine and a cracker or two and I have a teeny sliver of cheese...while Greg has a chunk or two.... and before you know it...it's supper time! Scrumptious libation! And very upscale now! Make mine a dirty one!